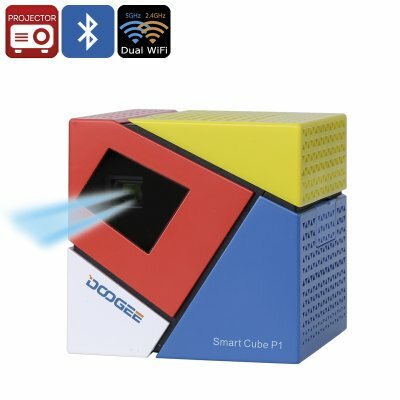 Successfully Added DOOGEE Smart Cube P1 DLP Projector - Android OS, RK3128 CPU, 120 Inch Image, 70 Lumen, Dual Band Wi-Fi, Bluetooth to your Shopping Cart. Behind the colorful Rubix cube like design of the Doogee Smart Cube P1 is well equipped DLP projector. Don't be fooled by its playful look this Android mini projector is a really well designed a powerful gizmo. Tucked away from view behind the colorful plastic exterior is a hidden USB 2.0 and micro USB port. With Wi-Fi and Bluetooth connectivity there's plenty of options for adding in easy controls, whether it is a mouse, keyboard or wireless gamepad, you can use them all with the Doogee Smart Cube P1. There is a simple and easy to use remote control app as well that can be installed by just scanning the QR code. This will bring you all the main functions required for a presentation and is supported on Android 4 and above as well as iOS 6.0 upwards. Equipped with Texas instruments DLP (Digital light processing) technology this 70 lumen projector has an 854x480 native resolution and can support 1080P full HD media. The 1.19:1 throw ratio and a projection distance of up to 5 meters will let you enjoy a 40 to 120 inch image size. The colors appear very well and the brightness is sufficient for a small room letting you enjoy a movie with family and friends or enjoy some gaming fun. A mini built-in speaker offers you some audio output but for a fuller sound, you can always make use of the Bluetooth connectivity to hook up an external speaker. The Smart Cube P1 measuring just 62mm on each side is an exceptionally portable projector, and while it comes with an external power pack and USB lead you don't need them with you as the built in 4800mAh battery supplies enough power for you to enjoy a good few hours of usage time before needing to recharge. Powered by an RK3128 CPU and with 1GB of RAM and sporting an Android operating system the Smart Cube mini projector lets you surf the web or download and play content directly on the projector. Alternatively, you can use the USB port to play from a memory pen or other device. The Doogee Smart Cube P1 projector comes with a 12 months warranty, brought to you by the leader in electronic devices as well as wholesale DLP and mini projectors..